Today we had a long ride from Chichester meeting up for elevenses at Tesco Cafe, Petersfield with riders coming there direct by car or bike. I led the ride in place of Phil and Mary who were not able to make it. Weather was not promising at first with constant light rain and a strong SW wind. This however cleared by 11.00 with good sunshine in the afternoon. 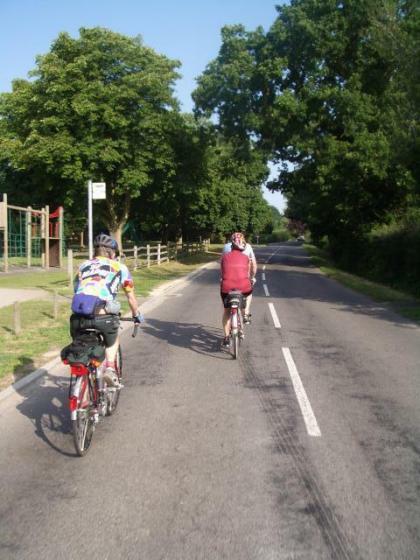 Gillian, Colin and Chris joined me for the ride to Petersfield. We rode via Funtington, Compton and Harting. We had a welcome break at Tesco where we were joined by Steve, Ann, Adrian and John Wickens from Arun Adur. Gillian and Chris headed back from Petersfield. The remaining 6 of us headed on by way of a lane to East Meon and then along the Meon Valley to West Meon. Then along some quiet lanes to Cheriton and on to lunch at the Tichborne Arms, Tichborne. In the afternoon we did a lot of meandering up and down quiet Hampshire lanes near Privett and High Cross. The planned route was to descend down to Petersfield on the hairpin bends of " Little Switzerland" near Steep. However when we arrived at the top the road was firmly closed with 2 lots of substantial barriers preventing even bikes getting through and a notice about serious subsidence. The map was consulted and the diversion by road would have been quite long. There was a bridlepath on the map down a farm track so we headed down it. After following the ridge a little way the track plunged steeply over the edge with deep ruts and slippery chalk which we all walked down. 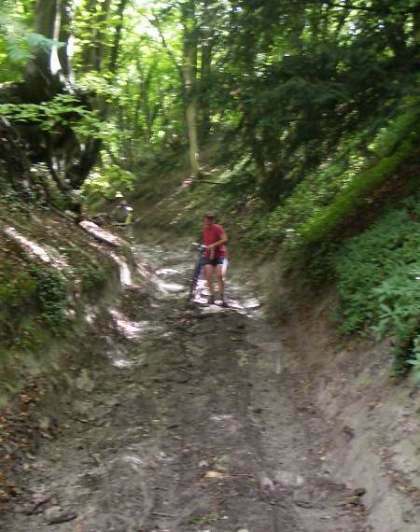 At the bottom we rejoined tarmac at Oakshott and took winding lanes to Steep and Petersfield. Everybody agreed it was a memorable and challenging Ride. By the time I returned to Pagham my mileage was 85 and from and back to the Cross it was 73. Weather today was fresher than of late at about 22C and sunny with patchy cloud. Freda was unable to lead the Ride today so I led on the way out and Kath took over for the return. We had a good attendance with 10 turning out including 3 newcomers. We headed out to the Saltern Way cycle route alongside Appledram Lane and then across to the Yacht Basin. Then backroads over to Birdham and Earnley Garden Centre Cafe for Tea. 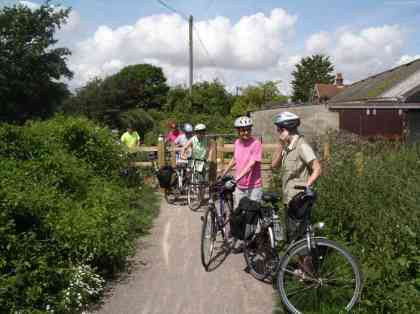 Kath led the group back via Almondington and I split off for home via Sidlesham and the cross fields route to Fisher. The hot weather of the previous week has broken, and tonight was much duller and cooler of late. Nonetheless there was very little wind and it made for good cycling weather. Continuing the theme of the past few weeks however, only 3 riders made the start point – Alan, Graham, and Val. Alan led us at a gentle pace through Middleton-On Sea, Bilsham and Yapton, where we took the path around the recreation ground to the Church, and then onwards to Maypole Lane where we crossed the railway. At this point the lane is little more than rough track, and it crosses the main line by means of an unmanned “occupation” crossing where it is necessary to open the gates manually. As we did so we noticed trains approaching from both directions. Both were at safe distances away, but the westbound service was running at considerable speed, contrasting with the eastbound train which was running at caution with a single amber aspect showing on the signal ahead. The eastbound driver obviously had us in his sights and gave several long blasts on his horn. There have been a number of suicides on this part of the line in recent months and drivers are clearly keeping vigilant. Two of us crossed the track but I held back to await the passing of both services. For my trouble I received a prolonged blast from the fast moving westbound train, and the combined noise from both trains must surely have given the environmental health officer cause for concern. The excitement over, we continued into Barnham, then taking the lane northwards to Walberton and the Holly Tree pub. We thought we had made good time but found the Chichester start group (5 of them) already well settled into their chairs and giving the impression they had been there all evening. A short while later Edwin joined us direct from his time trials, and after an appropriate pause for refreshment, we departed back home taking him and John from the Chichester group back with us. The return run was direct via Blacksmith’s Corner, North End and Yapton; mileage start to finish was 15. Sunday 2nd July. DA Event. 2 Weald Ride from Wisborough Green. Weather was sunny all day and very hot reaching about 31C. Tarmac was melting later in the day. The DA Event organised by Horsham Section involved a choice of 4 loops from Wisborough Green so members could choose from between 25 and 100 miles for the day. Phil and Mary and myself decided to go for the 100. I took the train to and from Billingshurst for the Event. Phil and Mary rode there, did the 100 and rode back, phew!! 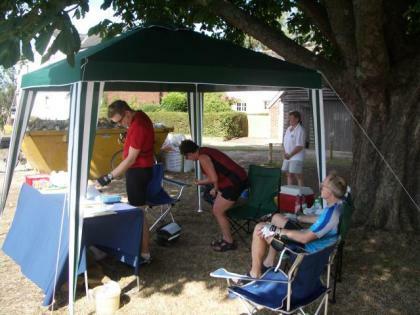 The event was well supported with 24 taking part from various Sections and doing various distances. Alan and Liz came up car assisted and did the northern loop. Nicola came up early on the same train as me and did 2 loops before the heat built up too much. Richard and Ernie rode up from Walberton Pond and met up with everyone for lunch. Phil and Mary and myself did the hardest loops first to the west and south and we were joined by John Maxim. After lunch we finished with the east and then north loops, enjoying over the day a wide selection of scenic lanes in the Weald between the North and South Downs. My mileage for the day including travelling to and from stations was 116. Average speed on the Event was 13.5 mph. Wednesday 28 June. Evening Ride to the Anglesea Arms, Hanaker, Felpham Start. I led this ride and in line with recent weeks turnout was well down with only Graham joining me. Weather was very good, warm with clear blue skies. We took a direct route via Colworth and Tangmere. Jeff and Beatrice were leading the Chichester start ride. John had almost joined them but his fork broke just before the start and he had to lock his bike and catch a bus home. Jeff and Beatrice left the Pub soon after we arrived to get home before dark. Graham and I took a similar route back to our outward ride. Colin was unable to lead this ride and as he had difficulty contacting anybody in the Section able to lead it Ernie agreed to lead. Weather was warm and dry about 23C but mostly overcast. Ernie was joined at the Pond by myself (Edwin) just back from the States and Phil and Mary. We rode out via Madehurst and Houghton to stop for elevenses at Wiggonholt. Here we were joined by Nicola, Richard, Mike, Alan & Liz and Eric. 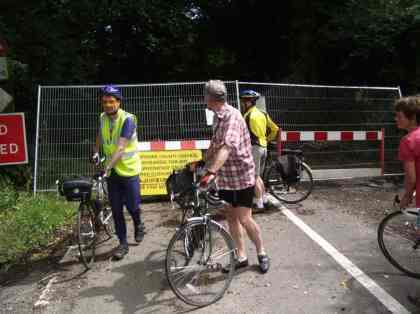 There was a good gathering of cyclists with Arun Adur members on a short ride and a large contingent from West Surrey. Our Bognor/Chichester group split in 2 with some making their way direct while the Walberton Pond starters took a long route on lanes via Barnes Green, At the Pub we met up with John Maxim who had been there for 45 minutes. Just as we went to order food the Pub decided to suspend food orders for a while because they were overwhelmed with numbers. We eventually got some food just as we were planning to move on elsewhere. We headed back to Wiggonholt for tea in different groups. On the way back we took the Kyber Pass route to Burpham for a change noting that there were still Buffalo in one of the fields. The ride home from Arundel was during the England match. Yapton was like a ghost town and Bognor was so quiet that I used the normally busy A259 into town. My mileage for the day was 67. Disappointingly, no riders turned up at the start point for this ride, so it was cancelled. This is the third week in a row where the absence of any riders has meant no evening start from Felpham. Since we arrived quite early (11.30am) we had our sandwiches in the large and deserted pub garden before the pub opened at 12.00. Since none of us were ordering food from the pub we left quite early, at 12.30, for the cross country haul to Tangmere. We had discovered that the Tea room at West Stoke where we were originally going to have afternoon tea was closed, but Avril had kindly offered to provide this at her house in Tangmere instead. Out route to Tangmere took us through Chalton, Compton, East Marden, Chilgrove, Lavant and then skirting the north side of Goodwood airfield before arriving at Tangmere. We made good time on this, despite the heat and the steep hills, arriving at 2pm 90 minutes after setting out from Clanfield. Since we were early we stopped off at the Tangmere Aeroplane museum for refreshments. Unfortunately since a party of school children had recently visited there were very few refreshments left, so we made do with what they had and sat outside for an hour until it was time to set off for Avril's. Upon arriving at Avril's we discovered a supine Mike relaxing in the front garden in one of the chairs provided. We made ourselves at home and soon after the other groups arrived, namely the Stansted Garden Centre contingent and Arthur's Moulton group, making for a fair size gathering of cyclists. We had a slap up meal of strawberries and cream with a selection of excellent home made cakes, washed down with cups of tea. After a pleasant afternoon at Avril's, we made our own ways home. My mileage for the day was 85km.